Albert Aoun, UFI MEA chapter chair, opening the UFI MEA Chapter meeting. 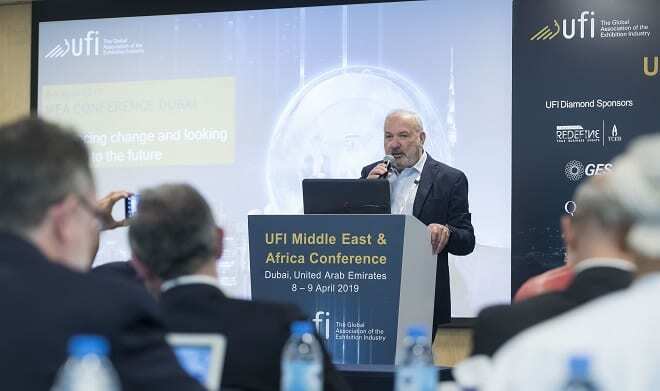 Around 100 delegates from 16 countries attended the UFI Conference for the Middle East and Africa in Dubai (UAE), held at the Dubai World Trade Centre on 8-9 April, making this the biggest conference so far that UFI has organised in and for the region. With the theme “Embracing change and looking forward to the future”, a mix of speakers from both inside and outside the business events industry discussed the role of smart technologies, economic outlooks and market expectations affecting our industry. “I am very happy that we could welcome this great cross section of the movers and shakers of our industry in the region”, says UFI MEA chapter chair, Albert Aoun. (L-R) Fawzi Ali Tulefat, Director of Exhibitions & Conferences Marketing & Promotion, Bahrain Exhibition & Convention Authority (Bahrain), Trixie LohMirmand, Senior Vice-President, Dubai World Trade Centre (UAE), Craig Newman, UFI President, CEO, Johannesburg Expo Centre Johannesburg (South Africa), Paul Grinnall, COO, Riyadh Exhibitions Company Ltd. (Saudi Arabia) and Chris Kilbee, SVP Construction, dmg events (UAE). Leading industry players of the region shared their strategic outlooks in markets like the UAE, Bahrain, Saudi Arabia, and South Africa, focusing on the potential of collaboration to expand and grow the exhibition market throughout the region. 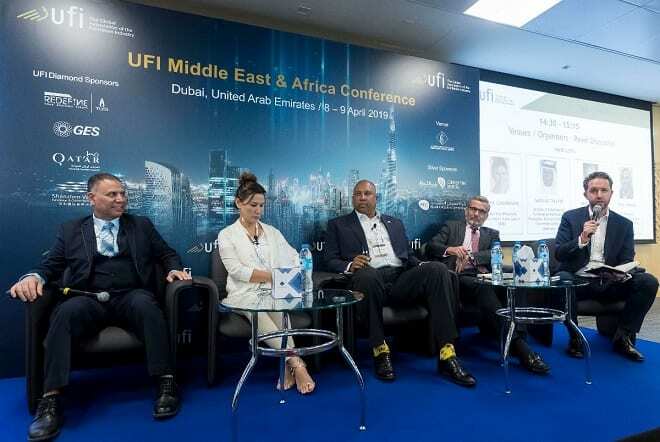 For the first time ever, key figures for the Middle East and Africa region from UFI’s new research on the economic impact of exhibitions were shared during the UFI chapter meeting that took place before the start of the conference. These figures were an advance preview of UFI’s comprehensive global “Economic Impact Study”, conducted by Oxford Economics that will be released later this month. The Middle East region currently sells 3 million square meters of exhibition space and hosts 125,000 exhibiting companies. Africa hosts more than 40,000 exhibiting companies whilst welcoming 2.15 million trade show visitors. With around 100 corporate members in the region, UFI president Craig Newman cited this data, as well as the Regional Conference, as key initiatives from UFI to support the continued growth of the exhibition industry.